The Gaymers Camden Crawl, scheduled to take place Friday 24th and Saturday 25th April, is pleased to announce MTV UK as its official television broadcast partner for 2009. This follows the Crawl's recent confirmation of BBC 6 Music as its official radio broadcaster. In conjunction with the event, MTV UK and 6 Music will jointly host the 3,000 capacity Roundhouse venue and exclusively film and record a series of extra special guests set to perform at the venue during the festival. This is the first time that MTV UK has partnered with the Crawl as part of their ongoing commitment to live music. In addition to the Roundhouse performances, the Gaymers Camden Crawl will play host to over a mile and a half of fantastic new talent for over thirty hours across more than forty venues, including the legendary Koko hosted by headline sponsors Gaymers. As well as its customary stellar line up of live music acts, the festival will feature a vast array of interactive daytime activities and cutting edge performances across the arts, including visual art, comedy, spoken word, theatre and much more. The programme kicks off from midday on Friday the 24th until the wee hours of the following Sunday. Upon arrival each ticket holder will be presented with an all-access wristband, programme guide, timetable and free download album to help plot his/her day's adventure. 'Crawlers' are granted unlimited access to all official festival venues featuring more than 150 live artists, daytime activities & arts programme and aftershow parties - capacity permitting. In keeping with Crawl tradition and the spirit of discovery, the full line-ups and stage times remain a closely guarded secret until each night and surprise guests may appear at any time and at any venue. 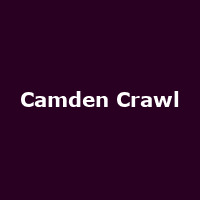 Tickets for the Gaymers Camden Crawl 2009, available as either 2-day or single day passes, are on sale now. BACKSTAGE COMEDY - Following its huge success at Camden Crawl 2008, Backstage Comedy will once again present a fine selection of stand up and musical comedy from up and coming award winning comics with the odd special guest. FALLING DOWN WITH LAUGHTER - Voted Best Small London Comedy Club at the 2008 Chortle Awards, Falling Down With Laughter showcases the best in sketch, stand-up, character and musical comedy. Past guests have included Jack Dee, Stewart Lee, Russell Brand, Sean Lock, Lenny Henry, Adam Hills, Brendon Burns, and Phil Nichol...so expect some surprises. UNDERBELLY - Underbelly is one of the main promoters at Edinburgh Festival and produces events and comedy tours all over the UK.Their commitment to finding and developing new talent has seen them become one of the foremost names in the UK's up and coming entertainment scene. Their fantastic line-up of comedians at their debut Crawl showcase will be one not to miss! APPLE & SNAKES - The top poetry promoters present an explosion of upbeat, in-your-face poetry featuring the X-rated-but-charming Salena Godden, with support from psychedelic funnyman Ash Dickinson and the waggish Alison Brumfitt. Compered by loveable motormouth Steve Larkin. BLOODY AWFUL POETRY - Returning to the line up after a hectic year, BAP are settling back into the Crawl, bringing with them the best in live acoustic music and much more including a poetry wall, confession booth, art exhibitions and the world famous 'Bloody Awful Poetry Exhibition'. BOOKSLAM - Bookslam events cover a wide range of storytellers from all disciplines - novelists, spoken word poets and musicians - gathering together for an eclectic day of words and music. London's coolest night out for nerds comes to the Camden Crawl bringing guests which include verbal junkies Scroobius Pip and Dockers MC; notorious novelist John Niven; the absurdly talented renaissance man, Joe Stretch; comedy that jumps off the wall from Dan Antopolski; and the sweetest bittersweet music from Lail Arad. Patrick Neate will stick the whole thing together like corn flour in lumpy gravy. BONANZA - A club night, promoter and radio show now in it's sixth year, Bonanza showcases the best in Country, Americana and Roots music and is an umbrella for numerous club nights. Bonanza will be hosting 'The Battle Of The One Man Bands Round 3' at the Lock Tavern, a no-holds barred bout of cosmic country and trash-blues pugilism where 'you the audience' will decide the winner!... plus very special guest DJs. CLERKENVILLE WEST - Local promoter and scenester Punk Rock Dolly joins forces with legendary Clerkenwell pub venue The Betsey Trotwood to bring Crawlers an epic hoedown of Alt-folk, Nu-grass and Cosmic Country otherwise known as Clerkenville West. INDIE IDLE - The Gigwise Indie Idle unsigned artist competition will run over the weekend of the Crawl. On Friday, our panel of experts will whittle down the 10 semi-finalists chosen by public vote to a live final shortlist. On Saturday, the finalists battle it out live on stage to win a headline slot at the festival later that evening. HAWLEY ARMS SESSIONS - One of our favourite local pubs and renowned Camden hotspots presents a series of acoustic live sessions from their friends and favourite acts. ANDY ROSS PRESENTS - There are not many things more Camden than Andy. The former head honcho of Food Records and the man who brought us Blur, Idlewild and Jesus Jones amongst others hosts two afternoons of idiosyncratic performances generally not involving instruments requiring a plug or big thumpy drums. In previous years, he has introduced the likes of Soko, Mumford & Sons and Noah and the Whale at the Crawl. TURNING WORM - Launched in 2004 by two young rouges seeking fun, fortune and the best new bands in the world, TM now promotes successful club nights across in numerous venues with a wide variety of strange & beautiful bands, soloists, DJs, artists and poets featuring. FUTURE SHORTS - Cutting edge short film organisation Future Shorts returns to the Camden Crawl after last year's unforgettable sell out show. Fresh from innovative UK tours with Guillemots and Noah and the Whale, Future Shorts have an exciting event fusing music and film up their sleeve. Known for surprising audiences with audio visual extravaganzas and working with the most imaginative bands this will be one not to miss. HUNGA MUNGA'S CAMDEN COCKTAIL- Arts and crafts madness in Camden's favourite cocktail bar. Loads of art materials and crafty bits to explore your artistic side alongside amazing live music from three of HungaMunga's favourite bands: Gabby Young and Other Animals, Tabloid and Off Ground Touch..... and lots of fun and games. KARAUKE - (kar'e-yoo'ke) v. you sing, they play ukuleles! If you've ever fancied singing 'I will Survive' disco to and with an entire backing band of fine-tuned ukuleles, here's the chance...They provide the words, the music and backing vocals (should you need them) and do everything from Abba to The Undertones to Blur. MUSICAL BINGO - After their debut outing at last years crawl, the cast of Bring & Share's musical bingo is back and loaded with brand spanking new games just for festival goers. Spot the tunes, as they play out a fast and furious medley of songs. Only the eagle eared will walk away with supa-snazzy prizes! POP QUIZZES - Who Killed Bambi? is the famous music quiz London Lite touted last year as the "best music quiz in London". The Moshi Moshi Pop Quiz is in the Caffrey's Book of World Records as the longest running pop farce since records began. After the charming botch jobs at the last two Crawls, the Moshi Quizmasters have become something of a Camden Crawl institution. Loved and tolerated in equal measure. Like a strange-smelling distant Uncle on Christmas day. The legendary Brighton I Predict A Pop Quiz heads north to the bright lights of Camden Town to pose questions of a pop nature. There are prizes for all (while stocks last), special guests, interpretive dancing and picture rounds. SPEED HATING - Want a date? Join in the legendary 'Speed Hating', as Feeling Gloomy belt out classic anthems of misery from the likes of The Cure, Smiths and Dolly Parton. Tickets are to be exchanged for wristbands which allow free entry to each of the participating venues as individual capacities permit. Wristbands and programmes announcing the full line ups and timings for the event are obtainable from 11:00 am onward each day at the Camden Crawl ticket exchange point located at: THE ROUNDHOUSE (Chalk Farm Road, NW1). Please note that 2-day pass holders will need to return to ticket exchange to collect Saturday's timetable. Festival goers are advised to arrive early as there will be a full daytime programme on both days from 12:00 pm. Doors open for evening schedule at 5:30 pm most venues. There will be late night after show parties featuring live bands and DJs until 4:00 am both days.